NACE MR0175 / ISO 15156. 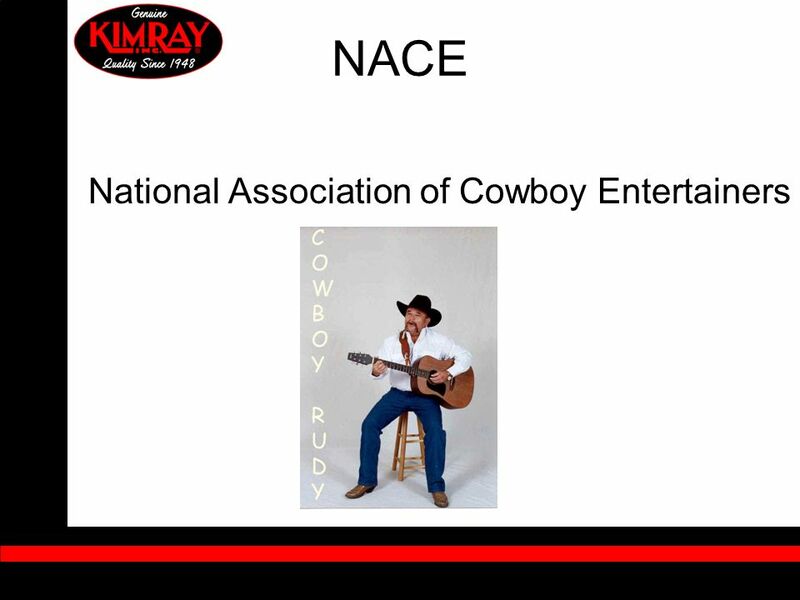 5 NACE History Interest begin in the 1950s after WWII. Natural gas was beginning to be used by industry. Sour gas was encountered in wells being drilled. Standard is based on 50 yrs of experience. Main goal is to prevent failures that would allow exposures to people and the environment. Standard applies to down hole, Xmas Tree, & surface facilities. NOT process plants, refineries, etc. 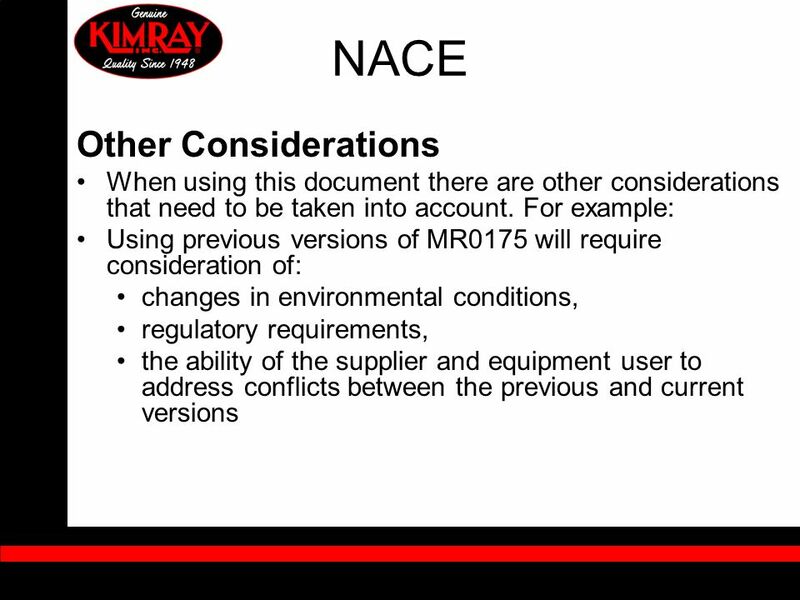 Keep in mind that NACE MR0175 is a document primarily intended to keep people safe We may not like the some of the limitations but these changes are largely due to material failures. 6 NACE History Fatalities from an accident in West Texas prompted the Texas Railroad Commission to ask the industry to write a document to help prevent such incidents in the future. Failure mode identified as SSC & SCC. Materials failing were identified as materials with HIGH HARDNESS & HIGH TENSIL STRENGTHS Keep in mind that NACE MR0175 is a document primarily intended to keep people safe We may not like the some of the limitations but these changes are largely due to material failures. 8 NACE The new standard: addresses the synergistic effects of H2S with other environmental factors (chloride content, temperature, pH, etc.) 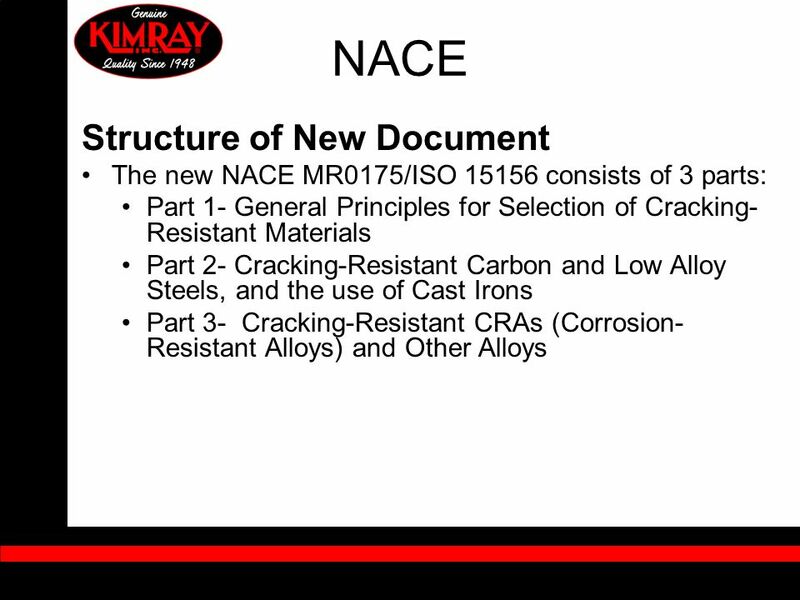 on the cracking resistance of many listed materials; limits the use of many of the listed metals through additional environmental restrictions which were not taken into account by the previous NACE MR0175 versions. “It is the responsibility of the user to determine the operating conditions and to specify when this standard applies. 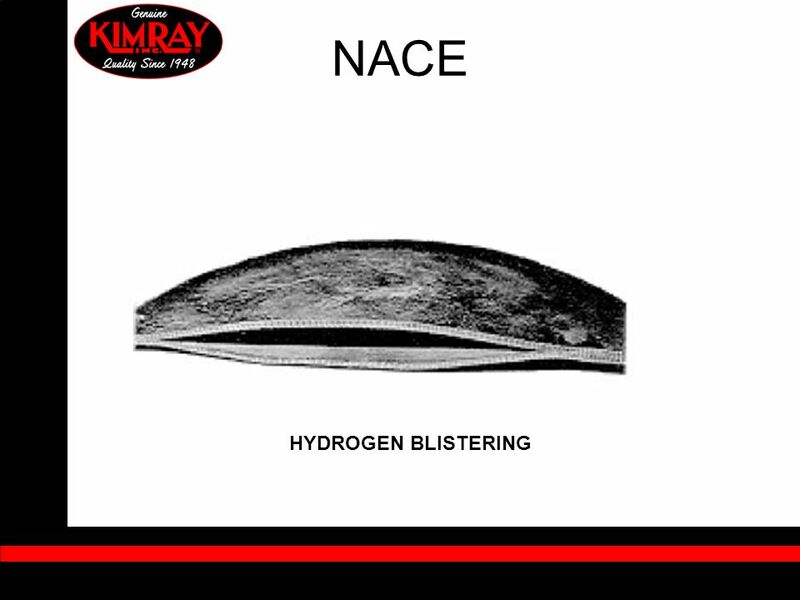 The manufacturer is responsible for meeting metallurgical requirements. It is the user’s responsibility to ensure that a material will be satisfactory in the intended environment.” The owner company is a user. These are NOT users. An equipment manufacturer is NOT a user. An mill is NOT a user. A distributor is NOT a user. A consultant or contractor are NOT users. select the carbon and low alloy steels, cast irons, CRAs (corrosion-resistant alloys) and other alloys suitable for the intended service. (Part 1: Section 5 & Section 6) document the selection and qualification of materials used in the H2S environment. 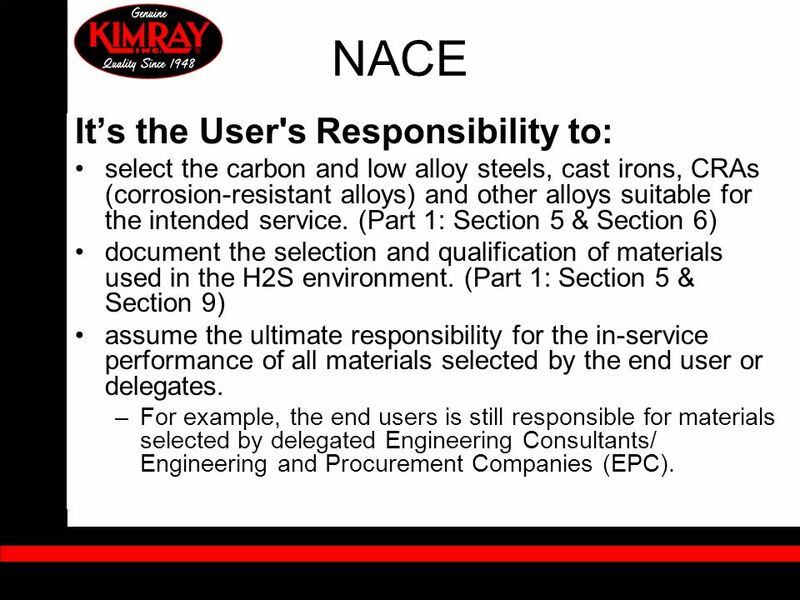 (Part 1: Section 5 & Section 9) assume the ultimate responsibility for the in-service performance of all materials selected by the end user or delegates. For example, the end users is still responsible for materials selected by delegated Engineering Consultants/ Engineering and Procurement Companies (EPC). 13 NACE The manufacturer is responsible for meeting metallurgical requirements. It is the user’s responsibility to ensure that a material will be satisfactory in the intended environment. Paragraph is a disclaimer-type of statement: “Materials included in this standard are resistant to, but not necessarily immune to, SSC and/or SCC in stated conditions. Improper design, manufacturing, installation, selection, or handling can cause resistant materials to become susceptible to SSC and/or SCC.” This is telling the user: You are responsible for materials selection. We cannot guarantee successful use or no failures or cracking, etc. 14 NACE The new edition spells out more clearly that materials selection is up to the user—NACE cannot give advice and will not get involved in negotiations or a dispute between users and manufacturers. 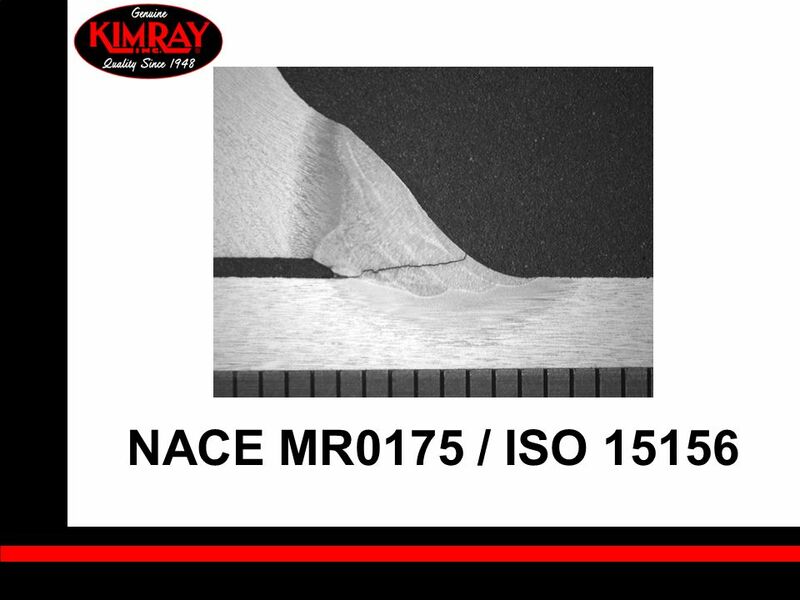 CAUTION: THERE MAY BE REGULATORY REQUIREMENTS THAT SPECIFY REQUIREMENTS IN MR0175 IN SOME LOCATIONS. Regions of environmental or SSC severity. (Figure 1 of Part 2: Clause ) Four severity regions are defined based on the effect of the in situ pH and H2S partial pressure on the carbon and low alloy steels. This differs from previous editions where only the partial pressure of the H2S was considered. 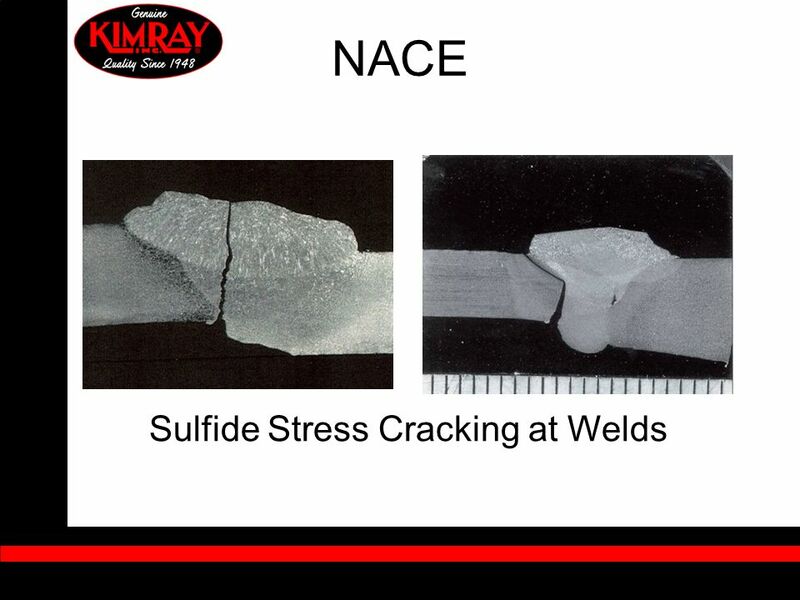 Hardness requirements for welds (Part 2: Clause ) Three different hardness test methods are acceptable for weld procedure qualification: Vickers (HV10 or HV5), Rockwell 15N, and HRC (with specified restrictions). This differs from previous editions where HRC was the primary basis of acceptance. 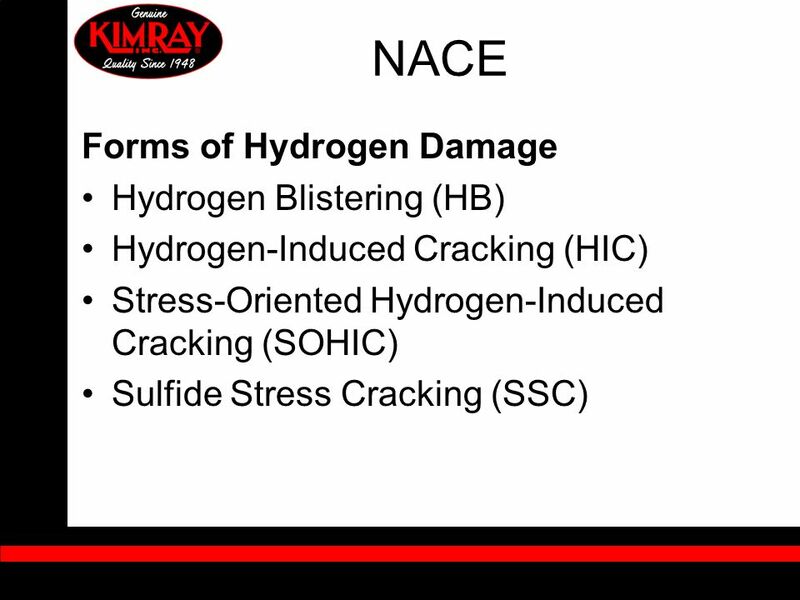 Consideration of HIC/SOHIC/SZC/SWC (Part 2: Section 8) These additional cracking mechanisms, which result from the synergy of H2S exposure and various material factors (steel chemistry, hardness and manufacturing methods) should also be considered. 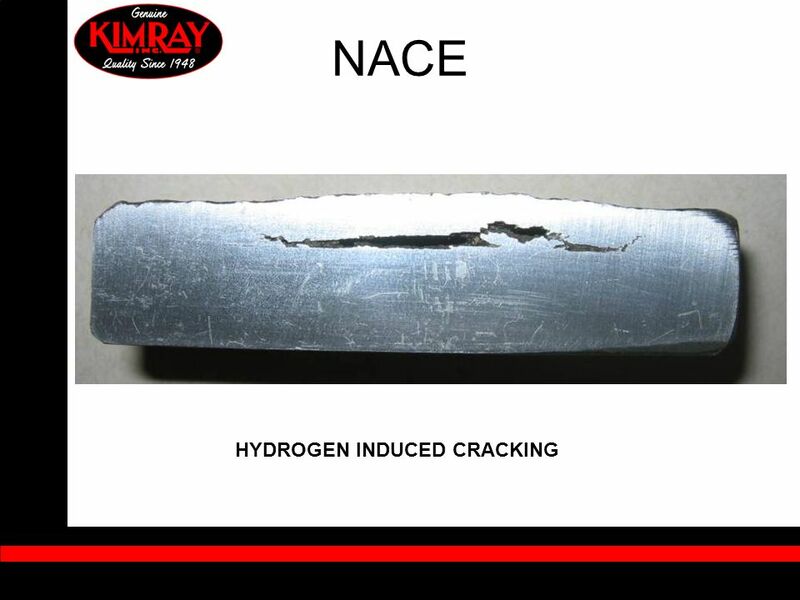 Depending on the alloy, environmental restrictions may include: maximum chloride content, maximum H2S partial pressure, maximum temperature, minimum pH application limits depending on the presence of free sulfur in the system. In previous editions of MR0175, several legacy materials had no environmental restrictions, implying they were suitable for any sour service environment. 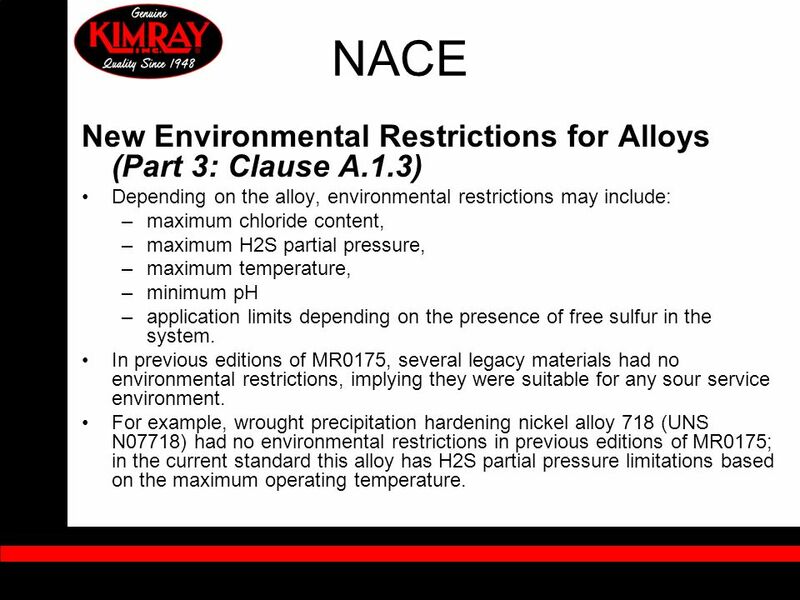 For example, wrought precipitation hardening nickel alloy 718 (UNS N07718) had no environmental restrictions in previous editions of MR0175; in the current standard this alloy has H2S partial pressure limitations based on the maximum operating temperature. 20 NACE Changes: New Environmental Restrictions for Alloys (Part 3: Clause A.1.3) Some alloys may have a range of acceptable environmental parameters depending on the severity of the in-service conditions. The environmental limits listed in Tables A.2-A.42 give the allowable parameters for the H2S partial pressure, temperature, chloride content, presence of sulfur and pH. As cracking behavior can be affected by the complex interactions of these parameters, there is some discretionary latitude for interpolation depending on the material’s intended application or service conditions; For example, austenitic steels such as AISI 316SS will have different service limitations based environmental parameters such as partial pressure of H2S, temperature, chloride concentration and in situ pH in the production fluid. AISI 316SS and AISI 304SS have a new temperature limit of 140F and H2S partial pressure limits. NACE is evaluating requests for changes. 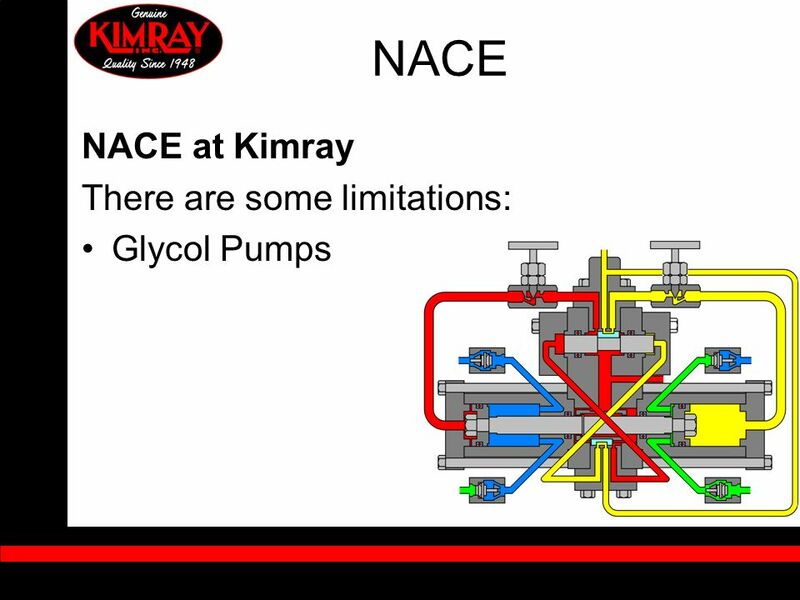 The general usage of some previously approved materials has been restricted to specified components only. For example, 17-4 martensitic, precipitation hardening stainless steel was deleted from the general usage section, but remains an acceptable material for various components of wellheads and Christmas trees, provided a maximum H2S partial pressure of 0.50 psi and minimum pH of martensitic is no longer allowed as a pressure containing component. 22 NACE Changes: Corrosion Resistant Alloy Categories (Part 3: Clause A.1.1) A CRA category is a broad-based group of alloys defined in terms of chemical composition, manufacturing process, and finished condition. These categories or materials groups (austenitic stainless steels, martensitic stainless steels, etc.) are further split into material types (similar compositional limits) and individual alloys. For example, Annex A, Table A.2 outlines the environmental and materials limits for the general usage of austenitic stainless steels (AISI 304SS, AISI 316SS, etc). This table is sectioned into general materials type and individual alloys, e.g. UNS S20910. The individual alloys tend to have broader environmental limits than those set for the group. The UNS S20910 can be used at a slightly higher temperature than AISI 316 at similar partial pressures of H2S. 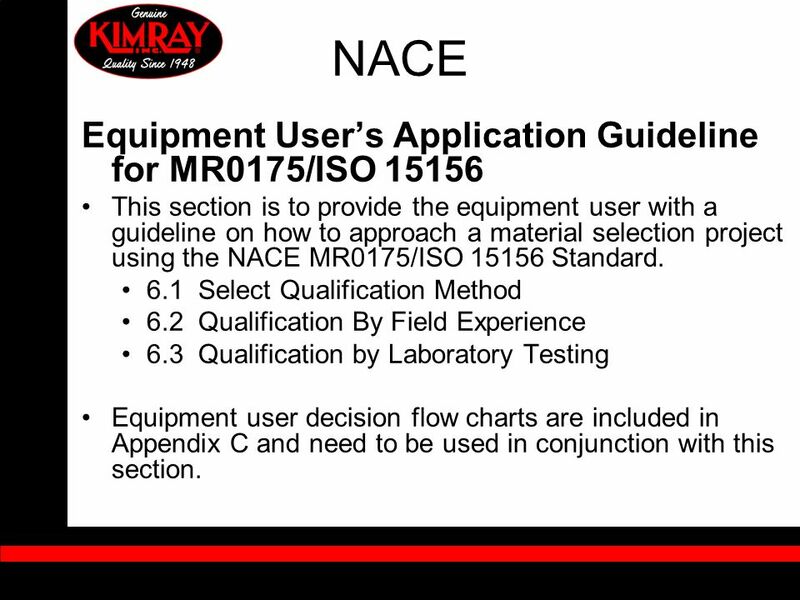 This section is to provide the equipment user with a guideline on how to approach a material selection project using the NACE MR0175/ISO Standard. 6.1 Select Qualification Method 6.2 Qualification By Field Experience 6.3 Qualification by Laboratory Testing Equipment user decision flow charts are included in Appendix C and need to be used in conjunction with this section. 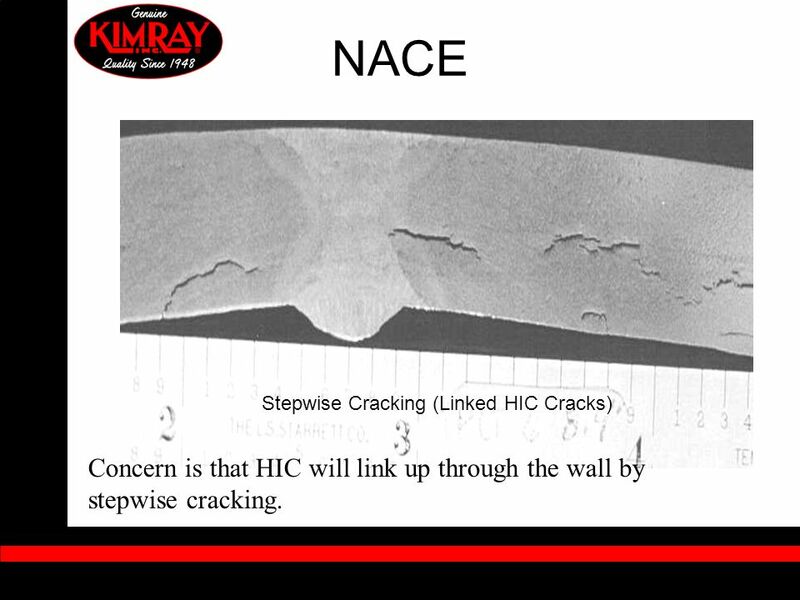 31 NACE Stepwise Cracking (Linked HIC Cracks) Concern is that HIC will link up through the wall by stepwise cracking. 35 NACE Hydrogen Damage Residual Stresses from Welds can make matters worse. 36 NACE Hydrogen Damage What temperatures are metals more susceptible to Hydrogen Damage? (High, Low or Moderate temps) At High temps Hydrogen atoms pass right thru the metal. 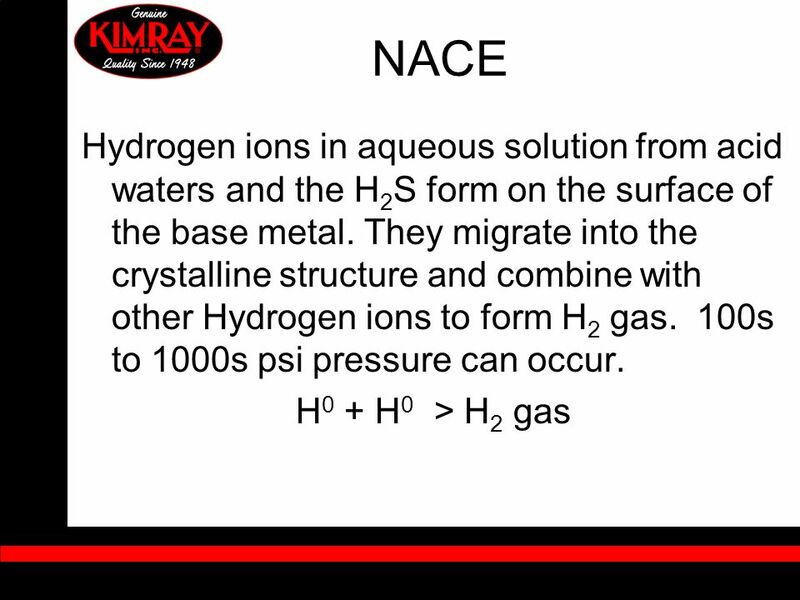 At Low temps Hydrogen charge rates are small. Worse damage occurs at Room Temp. ! 38 NACE NACE at Kimray Kimray can provide most products for NACE service. Certifications and documentation are provided when NACE components and products are ordered. 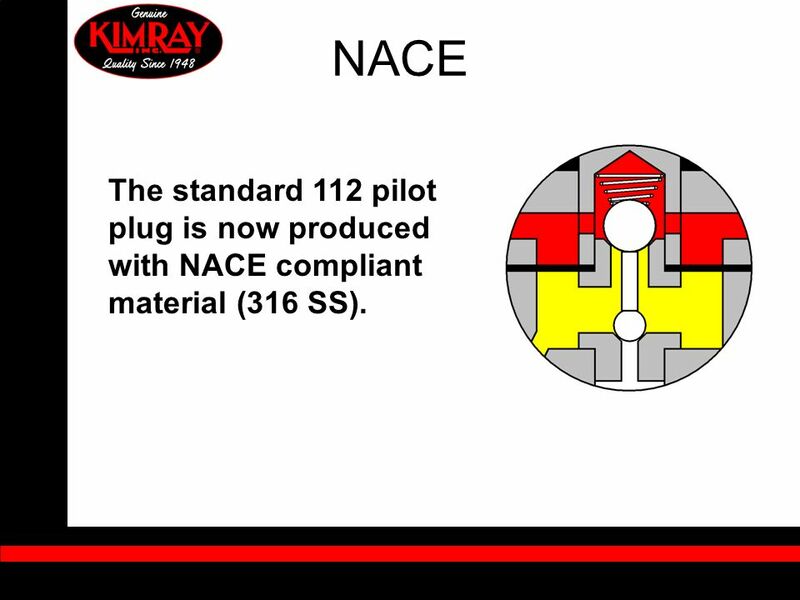 43 NACE The standard 112 pilot plug is now produced with NACE compliant material (316 SS). 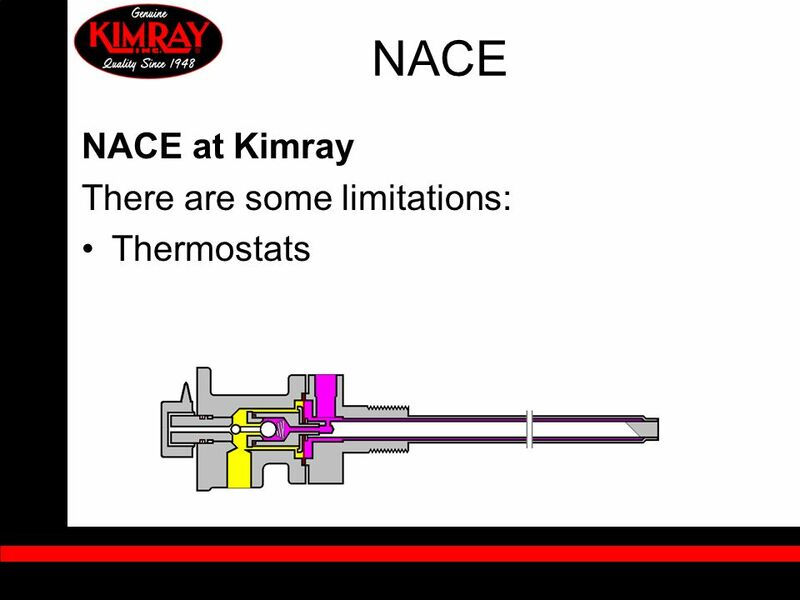 45 NACE NACE at Kimray Kimray has implemented a new Heat Treating standard that documents the procedures to properly heat treat NACE components. 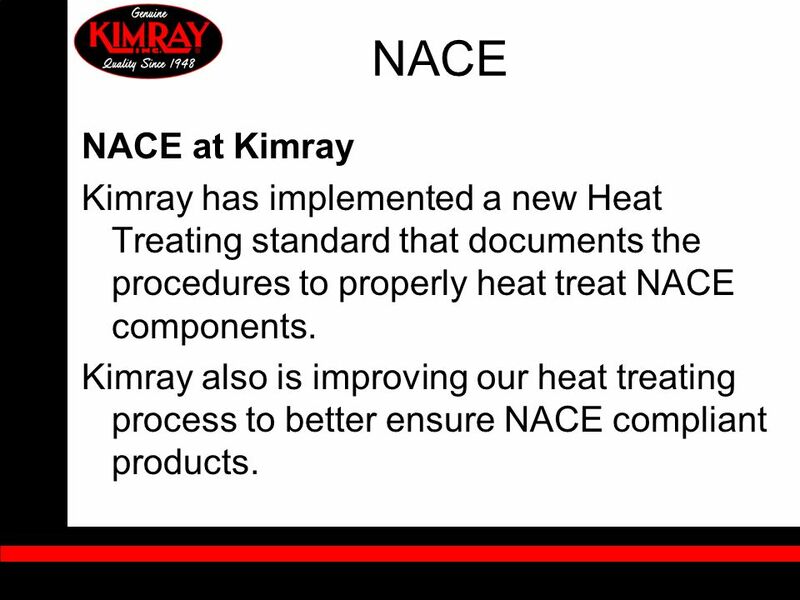 Kimray also is improving our heat treating process to better ensure NACE compliant products. Download ppt "NACE MR0175 / ISO 15156." EPNM 2012 Metallurgical Considerations in Hot Metalworking Bi-Metal Materials John Banker Vice President Customers & Technology Dynamic Materials Corporation. ANODIC PROTECTION Feasibility of anodic protection is firstly demonstrated and tested by Edeleanu in 1954. 10423:2009 / API 6A 20 th ed. Table 9 – Steel composition limits. 1 Electrochemical Machining (ECM). 2 Electrochemical Machining Nontraditional machining process of removing metal from extremely hard materials using. 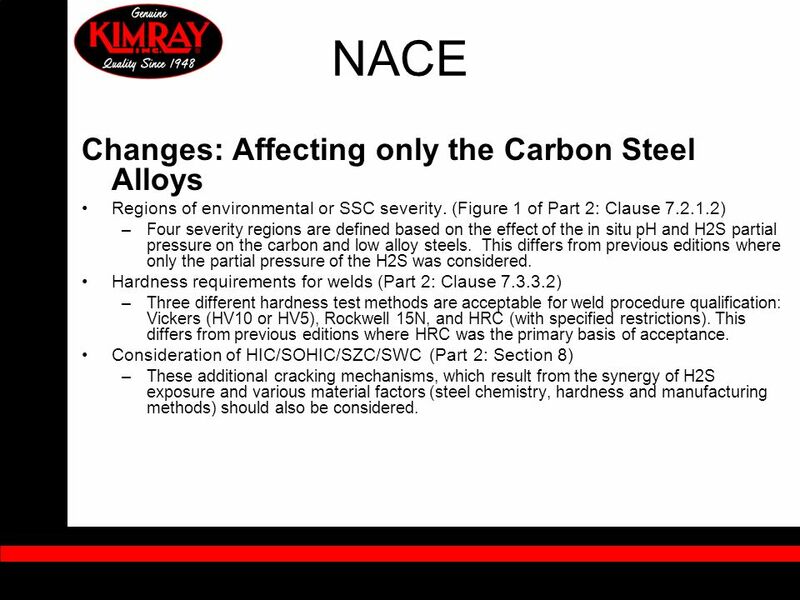 6-1 Chapter 6 Overview b Four major alloy groups most common: Aluminum, magnesium, zinc and ZA Aluminum, magnesium, zinc and ZA b These alloys have a range. Welding Metallurgy 2. Lesson Objectives When you finish this lesson you will understand: The various region of the weld where liquid does not form Mechanisms. 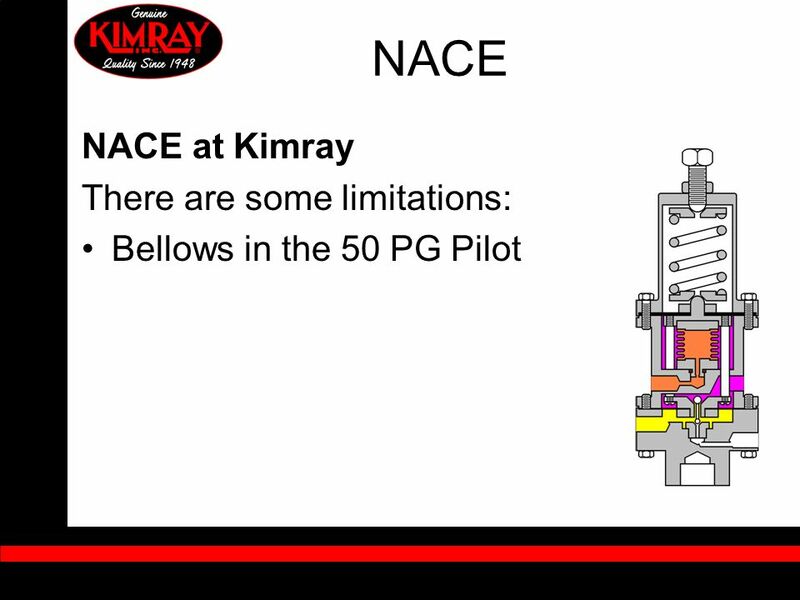 WELDABILITY The weldability of a material refers to its ability to be welded.welded Many metals and thermoplastics can be welded, but some are easier to. Types of corrosion Dr. Syed Hassan Javed.